In good weather, it's easy to find the Hitching Post in Matlacha. If it's not raining, an Indian mannequin sits out by the road in his chair enticing passersby to stop. 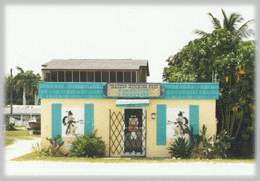 Once inside, customers find a tiny shop full of jewelry and decorative art from the Southwest. Owners Cindee and Jerry Tolliver keep their shelves full, even in the summer. The Tolliver's wall-to-wall cases show off many different styles of jewelry. 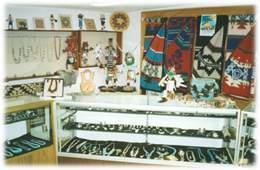 The most colorful pieces are made by Zuni artists known for their smaller, finer work with stones which they cut to fit the design of the piece. The Tollivers fly to New Mexico in the fall to begin their buying trip. They will travel throughout the southwest carefully selecting the very best pieces as they go. "We close up shop usually in September to clean, polish all the silver, paint and fix up the shop before we go out West to buy." Once there the Tollivers will buy from individual Indians as well as well as other reputable dealers and traders. 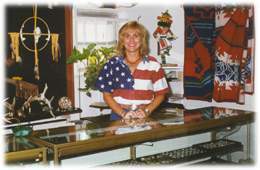 Friends and former owners Pat and Vera Holmes had spent many years for their life buying and trading southwestern jewelry. During that time they had established excellent contacts in various locations all over the southwest. Today we still buy from many of those same people. This enables us to bring to our customers the best quality and pricing available anywhere.